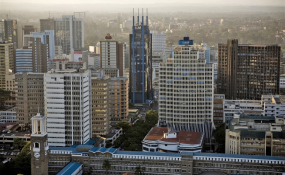 An aerial view shows the Nairobi city center in Kenya (file photo). Security officers have been deployed to Westlands in Nairobi after gunshots heard in the area around Dusit Hotel. Police say a team from the General Service Unit has been dispatched.